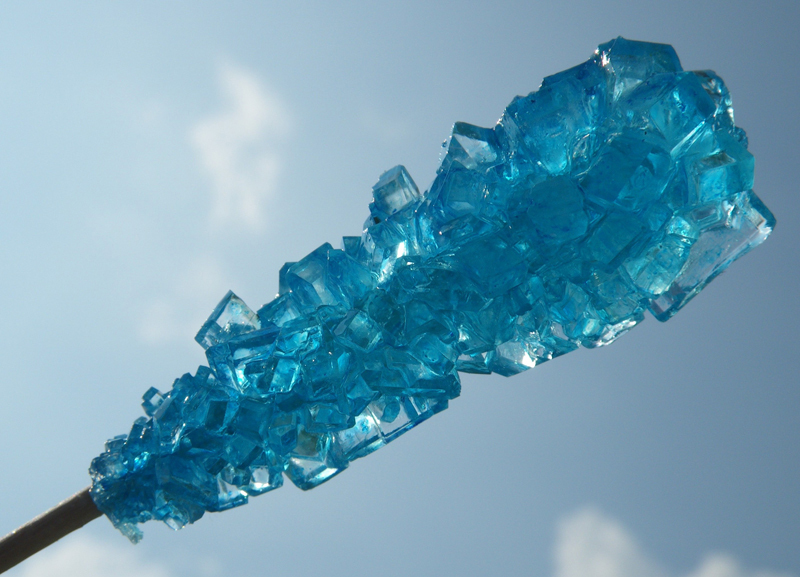 Sugar crystals are called rock candy because these hard crystals are edible. Sugar (sucrose) crystals are one of the few types of crystals you can grow and eat. You can eat the natural clear crystals or you can color and flavor them. The procedure is really easy. Dissolve the sugar in the boiling water. You can heat the sugar solution on the stove or in the microwave if you have trouble getting the sugar to dissolve. Add a few drops of food coloring and flavor, if desired. Allow the solution to cool a bit before pouring it into your jar. You don’t want to get burned! Pour the sugar solution into a jar. Place a wooden skewer into the jar or else hang a string into the middle of the jar, tied to a pencil or butter knife. Place the container somewhere it won’t be disturbed. You may wish to cover the jar with a paper towel or coffee filter to allow evaporation while keeping the crystal solution clean. It may take a few days to get good crystal growth. If you see crystals forming on the top of the jar, you can remove them and eat them. If you leave them, these crystals will compete with your stick or string for sugar and will reduce the size of your crystals. Remove the crystals and enjoy them! If you want to store the crystals before eating them, keep them in an airtight container so humidity in the air won’t make the rock candy sticky. So you have to add the flavoring and the food coloring in the solution when it’s still in the pan? Is there a faster way to grow them? I found this very usefull for granulated sugar, but will powdered, brown, caster, and sanding sugar work?